A popular café in Bexhill has had a new shop front installed after a car crashed into its front window. Jempson’s Café, in Western Road, Bexhill, was hit by a car at 3.20pm on Tuesday, January 8. ‘Extensive damage’ was caused resulting in the café being closed the following day (Wednesday, January 9). A Jempson’s spokesman said: “We’re delighted that our café in Western Road, Bexhill, has had the new shop front installed following the incident and we’re fully up and running again. 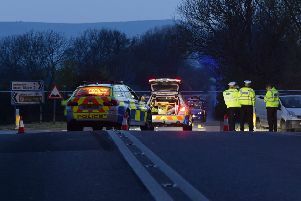 Sussex Police said nobody was injured in the crash. The managing director of Jempson’s described this as ‘remarkable’. Following the incident, Stephen Jempson added: “We are very thankful, that whilst there has been considerable damage to the front of the shop, no one appears to have been hurt. “This is remarkable when you consider how many of our colleagues were working in close proximity and how busy the pedestrian walkway outside can be. East Sussex Fire and Rescue said one person was ‘rescued’ from the vehicle which was lodged in the front window of the café but made no mention of any injuries.